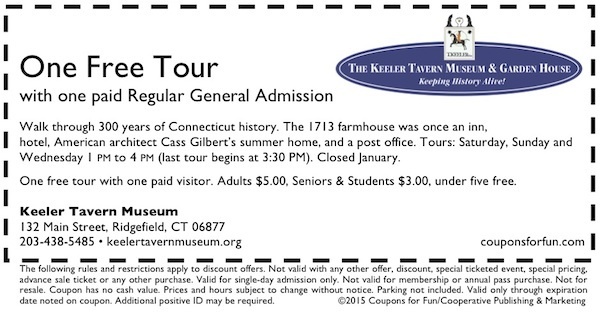 Keeler Tavern Museum in Ridgefield, Connecticut - Get savings coupon! Explore 300 years of Connecticut history. The 1713 farmhouse was once an inn, hotel, American architect Cass Gilbert’s summer home, the Ridgefield Post Office (for 50 years beginning 1803), and a museum. The British Cannonball in the corner post is from the Battle of Ridgefield, April 27, 1777. The Garden House and Garden were built by Cass Gilbert. CLOSED JANUARY.